The term hyperthyroidism covers any disease which results in overabundance of thyroid hormone. Other names for hyperthyroidism, or specific diseases within the category, include Graves' disease, diffuse toxic goiter, Basedow's disease, Parry's disease, and thyrotoxicosis. Located in the front of the neck, the thyroid gland produces the hormones thyroxin (T4) and triiodothyronine (T3), which regulate the body's metabolic rate by helping to form protein ribonucleic acid (RNA) and increasing oxygen absorption in every cell. In turn, the production of these hormones is controlled by thyroid-stimulating hormone (TSH) that is produced by the pituitary gland. When production of the thyroid hormones increases despite the level of TSH being produced, hyperthyroidism occurs. The excessive amount of thyroid hormones in the blood increases the body's metabolism, creating both mental and physical symptoms. Only about 5 percent of all individuals with hyperthyroidism are younger than 15 years of age. About five times as many girls as boys develop hyperthyroidism. Almost all cases of pediatric hyperthyroidism are the form called Graves' disease. There is a form of hyperthyroidism called neonatal Graves' disease, which occurs in infants born of mothers with Graves' disease. Children with other conditions, such as trisomy 21, Addison's disease, diabetes, systemic lupus erythematosus, rheumatoid arthritis, myasthenia gravis, vitiligo, pernicious anemia, and immune thrombocytopenic purpura are more likely to develop Graves' disease. Hyperthyroidism is often associated with the body's production of autoantibodies in the blood which causes the thyroid to grow and secrete excess thyroid hormone. This condition, as well as other forms of hyperthyroidism, may be inherited. Regardless of the cause, hyperthyroidism produces the same symptoms, including weight loss with increased appetite, shortness of breath and fatigue, intolerance to heat, heart palpitations, increased frequency of bowel movements, weak muscles, tremors, anxiety , and difficulty sleeping. Adolescent girls may also notice decreased menstrual flow and irregular menstrual cycles. Patients with Graves' disease often have a goiter (visible enlargement of the thyroid gland), although as many as 10 percent do not. These patients may also have bulging eyes. Thyroid storm, a serious form of hyperthyroidism, may show up as sudden and acute symptoms, some of which mimic typical hyperthyroidism, as well as the addition of fever , substantial weakness, extreme restlessness, confusion, emotional swings or psychosis, or coma. Fortunately, such a fulminant course of Graves' disease is rare in children and adolescents. Babies with neonatal Graves' disease may suffer from prematurity , airway obstruction, and heart failure. Death occurs in as many as 16 percent of these babies, and other complications from which survivors may suffer include craniosynostosis (early closure of the sutures of the skull, which can result in compression of the growing brain), and developmental delay . Parents should contact a child's pediatrician if the child shows the following symptoms: rapid weight loss, shortness of breath, intolerance to heat, heart palpitations, increased frequency of bowel movements, weak muscles, tremors, anxiety, and difficulty sleeping. An enlarged thyroid gland, seen as a bulge in the neck, should be examined by a doctor. 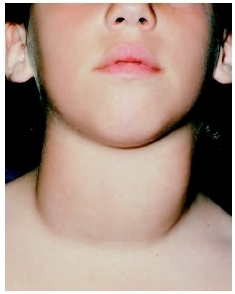 A symptom of hyperthyroidism is the enlargement of the thyroid gland, as seen in this youngster's neck. inflammation or involvement of the entire thyroid. Other tests can determine thyroid function and thyroid-stimulating hormone levels. Ultrasonography, computed tomography scans (CT scan), and magnetic resonance imaging (MRI) may provide visual confirmation of a diagnosis or help to determine the extent of involvement. Treatment depends on the specific disease and individual circumstances such as age, severity of disease, and other conditions affecting a patient's health. Radioactive iodine is often prescribed to damage cells that make thyroid hormone. The cells need iodine to make the hormone, so they absorb any iodine found in the body. The patient may take an iodine capsule daily for several weeks, resulting in the eventual shrinkage of the thyroid, reduced hormone production, and a return to normal blood levels. Some patients may receive a single larger oral dose of radioactive iodine to treat the disease more quickly. This should only be done for patients who are not of reproductive age or are not planning to have children, since a large amount can concentrate in the reproductive organs (gonads). Some patients may undergo surgery to treat hyperthyroidism. Most commonly, patients treated with thyroidectomy, in the form of partial or total removal of the thyroid, suffer from large goiter and have suffered relapses, even after repeated attempts to address the disease through drug therapy. Some patients may be candidates for surgery because they were not good candidates for iodine therapy or refused iodine administration. Patients receiving thyroidectomy or iodine therapy must be carefully monitored for years to watch for signs of hypothyroidism (insufficient production of thyroid hormones), which can occur as a complication of thyroid production suppression. Gonads —Organs that produce gametes (eggs or sperm), i.e. the ovaries and testes. Palpitations —Rapid and forceful heartbeat. Radioisotope —One of two or more atoms with the same number of protons but a different number of neutrons with a nuclear composition. In nuclear scanning, radioactive isotopes are used as a diagnostic agent. Thyroidectomy —Surgical removal of all or part of the thyroid gland. Hyperthyroidism is generally treatable and carries a good prognosis. Most patients lead normal lives with proper treatment. Thyroid storm, however, can be life-threatening and can lead to heart, liver, or kidney failure. Luckily, this form of fulminant hyperthyroidism is rare in children and adolescents. As of 2004 there are no known prevention methods for hyperthyroidism; its causes are either inherited or not completely understood. The best prevention tactic is knowledge of family history and close attention to symptoms and signs of the disease. Careful attention to prescribed therapy can prevent complications of the disease. Parents should be aware that hyperthyroidism is very rare in young children. However, once diagnosed, the condition needs short- and long-term treatment, with regular follow-up visits to the doctor. "Hyperthyroidism." In Nelson Textbook of Pediatrics. Edited by Richard E. Behrman et al. Philadelphia: Saunders, 2004. Hanna, C. E. "Adolescent Thyroid Disorders." Adolescent Medicine 13 (February 2002): 13–35. Thyroid Foundation of America. 350 Ruth Sleeper Hall, RSL 350, Parkman St., Boston, MA 02114. Web site: http://www.clark.net/pub/tfa.